Today is a wonderful day: the 108th anniversary of the birth of Cary Grant. To the left, he is pictured with a puppy in his pocket. If you follow me on tumblr, you know that I have an entire tag dedicated to photos of people with puppies, so this photo was a natural choice for my Archie “The Most Beautiful Man Ever” Leach Birthday Extravaganza post. But we’re not here to talk about puppies: we’re here to talk about movies. And what better way to celebrate the life of a fantastic actor than by talking about his movies? According to IMDb, Archie appeared in 75 titles throughout his life, with a career spanning from 1932 to 1966. He won 16 awards, including an honorary Oscar in 1970, and secured 13 more nominations during his career. He worked alongside such greats as Ingrid Bergman, Howard Hawks, Myrna Loy, Alfred Hitchcock, Sophia Loren, Frank Capra, Audrey Hepburn and Frank Sinatra. And he had the ability to make nearly any film exciting and enjoyable for fans of all ages — even a film about a dancing caterpillar. Yes, you read that correctly. A dancing caterpillar! Archie was a fantastic actor, with his talent shining particularly bright in his many comedic roles, though he was no stranger to drama or mystery either. My favorite Cary Grant films, for reasons ranging from nostalgic value to rib-cracking laughs, are The Talk of the Town (1942), Mr. Blandings Builds His Dream House (1948), To Catch a Thief (1955) and Charade (1963). What are yours? 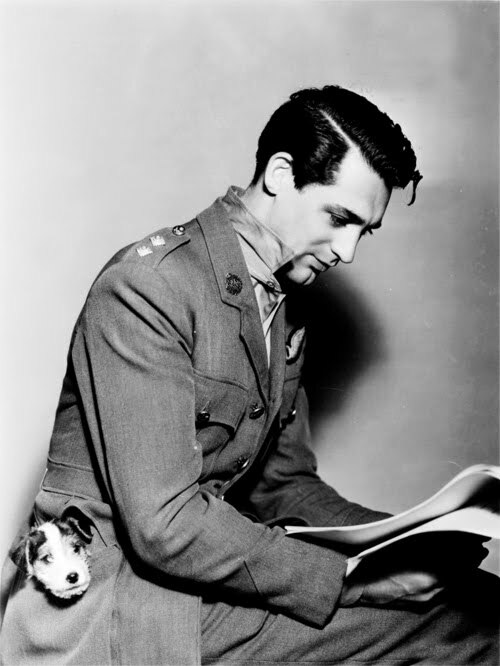 Image credit: http://iamnotagun.blogspot.com/2011/06/cary-grant-with-dog.html – Head over there for a few more great pictures of Archie with puppies! Previous Previous post: Thanks, YouTube!